An unaltered photocopy of your DD-214 other military issued document clearly displaying your award of the Joint Service Achievement Medal. Description. A bronze medal 1 7/16 inches (3.65cm) in diameter overall consisting of a star of twelve points and superimposed thereon an eagle holding three arrows as adapted from the Seal of the Department of Defense. Symbolism: The eagle holding three arrows suggests the nation's readiness to defend in the air, on land or at sea. The raised points denote vigilance in all directions. Ribbon: A ribbon 1 3/8 inches (3.49cm) in width consisting of the following vertical stripes: 1/8 inch (.32cm) Old Glory blue, 1/16 inch (.16cm) white, 1/8 inch (.32cm) green, 1/16 inch (.16cm) white, 9/32 inch (.71cm) Bluebird blue, 1/16 inch (.16cm) Old Glory red, 9/32 inch (.71cm) Bluebird blue, 1/16 inch (.16cm) white, 1/8 inch (.32cm) green, 1/16 (.16cm) inch white, 1/8 inch (.32cm) Old Glory blue. Background: a. 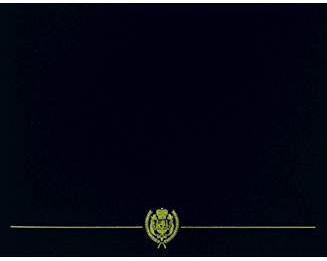 Authorized by the Secretary of Defense, August 3, 1983.
b. The JSAM shall be awarded only to members of the Armed Forces of the United States below the grade of O-6 who, after August 3, 1983, distinguished themselves by outstanding performance of duty and meritorious achievement. c. The JSAM shall be awarded in the name of the Secretary of Defense. (a) The Secretary of the Defense or the OSD Principal Staff Assistants for Service members assigned to either the OSD, the DoD Field Activities, or the joint DoD activities for which a Principal Staff Assistant has been designated "Executive Agent for the Secretary of Defense." (b) The DA&M, OSD, or designee for Service members assigned to multilateral and bilateral organizations; and other offices with the Executive Branch, Executives Agencies and Departments, or independent establishments and Government corporations. (c) The DJS, for Service members assigned to the Joint Staff and to the joint activities reporting directly to the Chairman of the Joint Chiefs of Staff that are not delegated approval authority for that decoration. (d) The CINCs of Unified or Combined Commands for Service members assigned to their respective Headquarters or joint activities directly under their operational control. They also may approve that award for the commander, his or her staff, and other Service members attached to a JTF as individuals (not as members of an assigned and/or attached unit). (e) The Supreme Allied Commander, Europe; the Supreme Allied Commander, Atlantic; the U.S. Representative to the NATO Military Committee; the Defense Advisor, U.S. Mission NATO; the CINC, NORAD; and the Commander, Korean Forces, Korea, for Service members assigned to their respective commands or Agencies, as reflected on joint manpower documents. (f) The Directors of Defense Agencies (except the DARPA and the DSAA) for Service members assigned to their respective Agencies. (g) The President, NDU, for Service members assigned to the University, the National War College, the Industrial College of the Armed Forces, and the Armed Forces Staff College. (h) The Executive Director, Military Postal Service Agency, for Service members assigned to that activity. (i) The Secretary of a Military Department who has been designated previously as the "Executive Agent for a joint function" by the Secretary of Defense, the Deputy Secretary of Defense, or the Chairman of the Joint Chiefs of Staff. (j) The Commander, Military Entrance Processing Command. (2) That authority may be delegated further in writing to an officer in the grade of O-6 in the Armed Forces of the United States or to a civilian of equivalent rank who is occupying an established command or staff position. (3) The authority to disapprove recommendations is given to officers with award authority. d. The JSAM shall take precedence with, but before, the Achievement Medals of the Armed Forces. e. Recommendations for the JSAM shall be submitted to the appropriate approval authority for processing. In those instances where the approval authority rests with the individuals specified in subparagraphs D.5.c. (1)(b), above, recommendations shall be submitted after approval to the Chief, Military Personnel Division, Personnel and Security Directorate, WHS, for processing. The Joint Service Achievement Medal was established on August 3, 1983, by Secretary of Defense Caspar W. Weinberger. The Joint Service Achievement Medal has been in effect since August 3, 1983. The Joint Service Achievement Medal is awarded in the name of the Secretary of Defense to members of the Armed Forces below the grade of colonel (or captain in the Navy) who, while assigned to a joint activity, distinguish themselves by outstanding achievement or meritorious service, but not to the degree that would warrant award of the Joint Service Commendation Medal. The Joint Service Achievement Medal is worn after the Commendation Medals of the separate services and before all of the other service Achievement Medals. Additional awards of the Joint Service Achievement Medal are denoted by oak leaf clusters, except in the case of the Coast Guard. Until 1998, additional awards to Coast Guard personnel were denoted by a gold star five-sixteenths of an inch in diameter. In 1998 the Coast Guard authorized its members to wear the oak leaf cluster on this decoration to denote subsequent awards; however, previously authorized gold stars will continue to be worn. 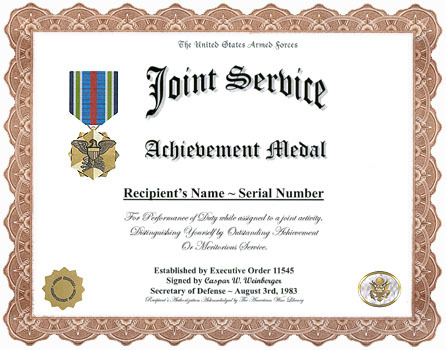 The Joint Service Achievement Medal was designed by Jay Morris and sculpted by Donald Borja, both of the Army's Institute of Heraldry. The identity of the first recipient of the Joint Service Achievement Medal was not recorded. A bronze medal one and seven-sixteenths inches in overall diameter, consisting of a star of twelve points. An eagle holding three arrows is superimposed in the center. The shape of the medal was chosen to make it distinctive from all other decorations, and the eagle was taken from the Seal of the Secretary of Defense, under whose authority the medal is awarded. In the center of the reverse there is a circle composed of the following inscription (in raised letters): JOINT SERVICE (which comprises the upper portion of the circle) ACHIEVEMENT AWARD (which comprises the lower portion of the circle). The space in the center of the circle is left blank for inscribing the recipient's name. The ribbon consists of a center stripe of red flanked on either side by stripes of light blue, white, green, white, and blue.